Mum had her heart set on two things with Nathaniel's photo shoot. She wanted him smiling and she wanted one of him on his tummy in his birthday suit all curled up with his knees tucked up (like a little frog). Of course, Nathaniel had different ideas. 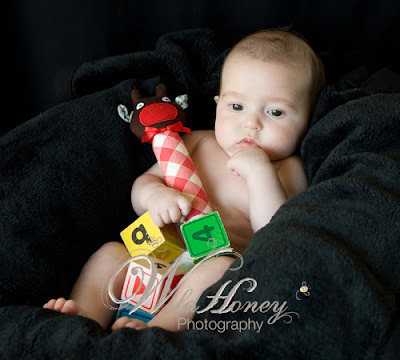 He was most content to show his serious side and wasn't having a bar of being on his tummy. Mum just about wore herself out trying to get him to smile and eventually was rewarded with this quick show of gorgeousness. That was the only smile he was giving us though!